And here's the essential list of things that you will need. The first step is always the hardest, and always the most liberating. 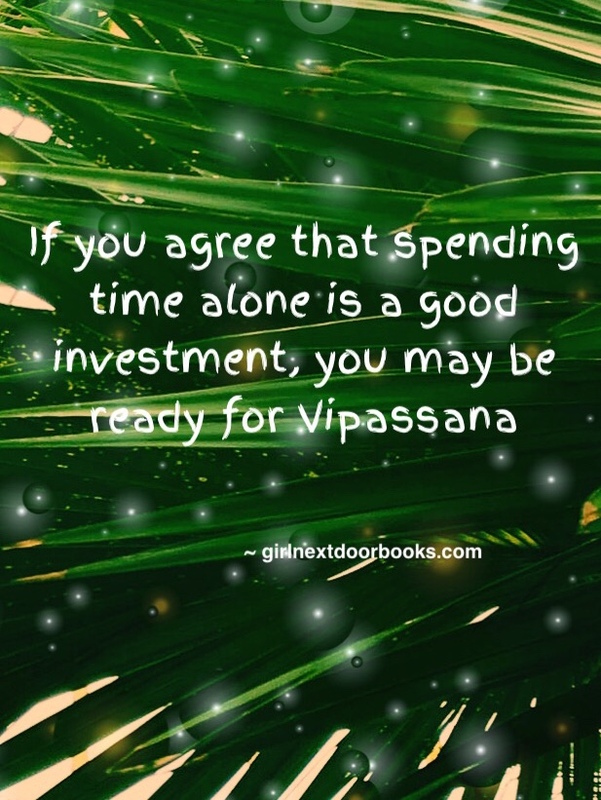 If you feel that spending time alone is a great investment, and you’re ready to take it to the next level, then Vipassana may be your next greatest move, as it is one of life’s gems. And like any gem, you have to work for it to appreciate it. As an old time student, I have had such a turbulent relationship with Vipassana, or should I say, my monkey mind wanted to run away from it but my greater self knew how valuable it was. On my first first 10 day meditation course at Dhamma Dipa in Hereford, UK, I was constantly falling asleep whilst sitting in the meditation hall, as I’d never meditated before. I went in head first and wasn’t ready. Luckily, I have a very stubborn mind and was determined to sit the whole course. Due to this, I practiced on lunch breaks and rest times, so that I could keep up with what is taught. Looking back now, I realise this was a silly mistake and it really doesn’t matter at what stage you are at because you will catch up before the course ends. However, I did catch up and it had such a huge impact on my mental health. I was so used to self-loathing throughout my youth and this course showed to me what torture I was putting myself through. Of course, this wasn’t the full cure of my self-loathing traits and habits, but it was eye opening. I was so intrigued by the science behind Vipassana and the teachings by Dr Goenka that I vowed to sit again, thinking that the next 10 day course would be just as blissful, as well as hard working. On the next sit, I knew the process and also thought that I didn’t need to work so hard to keep up this time, so I slowed down my pace. This is such a waste of valuable time. Not only did I end up sleeping too much, I often missed breakfast and my mind grew increasingly bored as I was eager to attend the Groove Amarda concert that I had bought a ticket for, the day after my retreat. It was such a hard 10 day sit, because I wanted to be at the concert the whole time, and so my mind wondered anywhere it could into the future. The next four 10 day sits were so up and down, some so difficult, others were manageable, one was even blissful. But none of the sits were the same, and as I learned from Dr Goenka, I made an extra effort, to allow each sit to be just as it is, from moment to moment. On my first sit, I would watch in awe, the Teacher and volunteer servers, as they would sit in complete stillness, no fidgeting, no movement. I knew I would never get to that stage. I didn’t realise that I was setting myself, self limiting beliefs as I did get to that stage, eventually. As the years grew, so did my meditation practice. I have had spurts of meditating for two hours daily, to not meditating at all, dependent on where I am in life and how disciplined. I have also served some 10 and 3 day refresher courses, and yes I am able to sit still for an hour, which dissolved my self limiting belief. Some of my biggest challenges on my retreats, have been my fear of spiders, which seemingly encouraged my mind to look for spiders during my time at Dhamma Dipa. On one occasion, just as we were about to start our group sitting in the hall, a spider started crawling towards my matt. As we are in noble silence, all I could do was flap my arms and point. The course Manager came across and swooped it away in one kind swoop. Since then, I have flitted between sitting on a matt, or sitting the whole course on a chair, dependent on how brave I am feeling. My fear has not gone away but I am definitely in a better place than I was, as I don’t react with fear, I can look at spiders now, and also swoop them away, with a glass and piece of paper to put them in. My other fears have been to sit still for 1 hour on the matt. Please don’t be afraid of this, there are options. You can request a chair if you really feel the need. There are some great tools for meditation now also, such as back rests and yoga straps, as well as cushions. The secret is to try and sit for the hour at home first. The other thing to remember, if you fidget, is to only do the group sittings when required. Use all of the other times so sit in your room and if you need to fidget, so let it be. As long as you try your best, you cannot lose. Another fear of mine was sharing a room with people. So I started in my own room, by request, and slowly integrated myself into a shared room. Now I love sharing a room with lovely people, and the greatest part is, you don’t need to speak to each other during the 10 days sit, as you have all agreed to take noble silence. So you are sharing a space without the need to talk. It is something that other parts of life do not offer, to share a space in silence for 10 days. Another fear of mine (I had many), was serving, volunteering for 10 days, and sitting at the front of the hall, where all of the new students could see you as you teach by example, of sitting still. But as my practice grew, my fears of this left me and I have served several times. You don’t even have to serve the full course if you don’t want to. There are other ways to serve too, before and after the course, to set up and clear up. What I find about Vipassana, is that it is very flexible on your needs and really wants to support you to getting the most out of your stay. So, if you have ANY fears at all, no matter how silly they are, discuss them in your application, and I bet you they can help. As a new student, you may have many fears. As an old student, you will be expected to work through your fears. This expectation is set by yourself, as you grow spiritually. I will always be eternally grateful for Vipassana, it feels like my second home when I visit, sharing a sacred space, with beautiful people. I’ve made amazing friends here, after the course has finished, one friend I call my soul sister. So to make it easier for your stay, here are some essentials that you will need. Slip on shoes – As you will be slipping your shoes on and off more times than you’ve had hot dinners! Flask – So that you are with a drink at all times when the kitchen is closed. Warm clothes – Dependent where you are sitting, but definitely in the UK. Earplugs – If you share a room, there’s usually a snorer, that snorer could be you. Clock – You will need to keep a check of time for your course schedule and your mobile phone will be locked away in a locker. Meditation cushion/chair – Find a pose that you can sit an hour for and get what you need to keep that pose. Toiletries bag – You’ll probably be keeping your toiletries in the bathroom with everyone else’s toiletries, so keep them in a bag. Once you have these essentials, you’re good to go, you’re good to start your inner journey which will always end up with a better version of yourself.